The real French macaron may be the best pastry in the world. It consists of two almond meringue shells held together with a filling of flavored pastry cream, preserves, caramel, chocolate ganache or a similar sweet substance. Until the 1990's, the undisputed best macaron was to be found at Ladurée in Paris, although other patissiers made their own versions. They came in vanilla, chocolate, pistachio, raspberry and coffee. Sometime in the early 90s, Pierre Hermé decided to reinvent the macaron, and the macaron wars began. He used an amazing variety of non-traditional flavors and dared to make square ones. Ladureé was forced to take up the challenge and other greater patisseries -- most notably, in my opinion, Dalloyau -- stepped up, as well, so you can now find flavors like cognac, cassis, lime, passionfruit, white chocolate, yuzu, griotte or lavender, among others. And fillings have evolved, too, to include savory as well as sweet items, such as smoked salmon and cucumber. One of the most amazing and delicious things I have ever eaten was a black truffle macaron from Pierre Hermé; it was so rich that I didn't even want a second one. I have never found a macaron in the US that matches the best French ones. Yes, I have tried Fauchon, Payard and Maison du Chocolat. The only solution, apart from going to France (or to Pierre Hermé's Tokyo branch), is to make them. I have taken a couple of lessons in France and can report that they are quite doable, although they require patience and practice. But mine are seriously good and, while not equal to the best French ones, I am told by a reliable critic (my wife) that they are better than any available for purchase in New York. 1. Blend together the ground almonds and confectioner's sugar and sift through a medium sieve. Throw away the few almonds that don't go through. 2. Using a standing or hand mixer, beat the egg whites until they are beginning to form soft peaks, add the sugar (and caramel if using optional caramel - - see Step 9 below) and beat until stiff peaks are formed. 3. Fold in the almond/sugar mixture and keep folding until pretty soft -- it should drop off the spatula in a very thick but steady stream (some say it should "form a ribbon"). 4. Using a pastry bag fitted with a medium round tip, pipe mixture onto a half sheet pan or other cookie sheet lined with parchment or a silicone mat. Let sit for 20-30 minutes. 5. Preheat oven to 320 degrees. 6. Put pans into oven, at 1/3 and 2/3 heights. Cook for 15-18 minutes. After 5 and 10 minutes, open the door of the oven a bit for 30 seconds to let moisture escape. 7. Remove from oven and let cool for at least 30 minutes, but more is better. CAREFULLY pry them off the parchment or silicone liner, trying to avoid sticking as much as possible. If they are sticking badly, wait a bit longer. 8. Turn them on their backs, put filling on one flat side and put another one on top, trying to match sizes as closely as possible. 9. OPTIONAL CARAMEL FOR SHELLS. Cook 50 g of sugar in a small frying pan on medium heat until it becomes a fairly dark caramel (don't stir until it begins to melt). Add water to get to a stable caramel and remove from heat; set the pan on a cool surface. Add this to the egg whites in Step 2 and reduce the granulated sugar by the 50 g used for the caramel. I always do this because it flavors the shell and also imparts a light caramel color that gives a hint of the caramel filling. Another approach, which I have not yet tried, would be to omit or greatly reduce the water, turn out the caramel on a silicone sheet, let it harden and then grind it into a powder to be added along with the sugar in Step 2. 1. Melt the sugar in a frying pan until it becomes a light caramel (don't stir until it begins to melt). 2. Add the butter and then the cream and the fleur de sel. 3. Allow to cool to room temperature (with the help of the fridge. Pour the caramel into a squeeze bottle (a funnel helps) to make assembly easier. It is good to keep the macarons in the fridge. They will keep longer and the salted caramel filling will not run. Take them out a half hour or so before eating. For another take on the whole process, take a look at the post entitled Strawberries and Vanilla Beans at Cannelle et Vanille, http://cannelle-vanille.blogspot.com. Aran, the blogger, is a pastry chef and hers are probably better than mine. Her method is very similar to the one I learned in Paris. In my post on Food Movies I noted that I had not seen Eat Drink Man Woman. Recently some friends suggested that I this was a major omission and lent me the DVD. They were totally right. How could I have missed this movie for so many years? Directed by Ang Lee, this is a lovely film in which magnificent Chinese food plays a starring role; indeed, food is the means by which the family that is at the center of the film communicates. The food is sumptuous beyond description and the story of how a widowed master chef and his three daughters seek to find themselves, happiness and one another is moving and well-told. Definitely among the top half-dozen food movies ever made. Salumeria Rosi, a new Italian charcuterie/restaurant on the Upper West Side (Amsterdam between 73rd and 74th Streets), offers authentic products of excellent quality. It is a joint venture of two Italian companies, one of which is the maker of parma cotto, exquisite cooked ham from Parma, land of the more famous cured prosciutto di Parma. In addition to parma cotto, there is a grilled version (piacenti) and a roasted version. All are excellent, but for me you can't beat the subtle mild flavor and texture of the parma cotto; great in a sandwich or just eaten plain. The prosciutto and coppa are also excellent, and they have culatello, a super-premium prosciutto that comes from the middle of the ham which has hitherto been unavailable in this country. I have not tasted the salami or sopressata yet, but these are made in USA for reasons that only the USDA understands. Salumeria Rosi also features a small variety of other Italian products -- cheeses, anchovies, spreads, etc. which I have not yet had the opportunity to try. Finally, there is a little restaurant that offers tasting plates of their meats as well as cooked dishes -- Italian tapas. All the ones I have sampled are straightforward and delicious. A welcome addition to the neighborhood. In the last few years a number of Japanese restaurants featuring cooked food, as opposed to sushi, have opened in New York. Most are downtown, but four excellent restaurants, with common ownership, have arrived in mid-town. Yakitori Totto, 251West 55th Street, and Torys, 248 East 52nd Street, as the names indicate, are yakitori restaurants that serve charcoal-grilled skewers of chicken parts. In addition to the conventional breast meat, thigh meat, wings and chicken meat balls (all of which are very good), they feature harder to find skin (kawa), breastbone (nankotsu), kneebone (hiza nankotsu), what we call the pope's nose (bonchiri) and various organs, among other things. Both serve very good vegetable skewers as well, and excellent noodle and rice dishes (fantastic grilled rice balls (yaki-onigiri!) that are traditionally eaten at the end of the meal. In Japan Yakitori is traditionally an accompaniment to beer, sake and/or shochu, and both restaurants have extensive offerings in these categories. 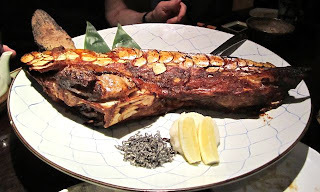 Aburiya Kinnosuke, 213 East 45th Street, serves robata-style cuisine, featuring charcoal-grilled fish, meat and fowl in addition to stew (nabe) and tofu dishes. Lots of variety, mostly excellent, in a convivial atmosphere. The newest member of this family is Soba Totto, 211 East 43rd Street, which not surprisingly, specializes in soba noodles that are made fresh on the premises. I had my favorite, kitsune (fried tofu) soba, which had a delicious broth unlike any I have had in Japan but undeniably authentic. I went to this wonderful little bistro in a far-flung part of the 17th arrondissement in December. 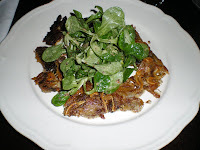 It was my second visit, and the second time I had their spectacular salad of pig ears (oreilles de cochon) and mache with grainy mustard vinaigrette (see picture). The rest of the food - fish and meat - is also very good, and the value (rapport qualité-prix) is extraordinary: a three-course menu for 32 euros, two courses for 28. L'Accolade is at 23, rue Guillaume-Tell, Métro Porte-de-Champerret or Pereire, 01 42 67 12 67. My wife and I also returned to an upscale bistro that I had been to before, also in the 17th, called Les Fougères, and had an excellent meal. They have a very good menu for 35 euros, but there are only two appetizers and two mains to choose from. This suited me fine, and I had a really good slow-cooked pork belly, which resembled the Japanese black pork. My wife chose a dove (palombe) from the a la carte selection and was more than pleased. Les Fougères, 10, rue Villebois-Mareuil, Métro Ternes, 01 40 68 78 66. Best wishes to all for a Happy New Year! And for the world: peace above all, and a much more prosperous 2009; hopefully the world can begin to crawl out of the global recession. We flew back from Paris to begin the New Year in the company of dear friends, as is our tradition. Our fabulous hostess provided wonderful foie gras en gelée and smoked salmon appetizers, which we devoured until and during the annual fireworks over Central Park (she has a great view from her living room and terrace). Then a meal consisting of rack of lamb, potato gratin and brussels sprouts followed by salad and cheese and finally an amazing chocolate cake that one of our co-guests brought from Payard. This is the meal we have had for years, and we all just love it. All accompanied by many bottles of champagne furnished by guests (including my wife and me), and toasts galore. A perfect beginning to the New Year!